Confessions of a Single Parent Pessimist: My Niece Is Now In The Weaning Stage! My Niece Is Now In The Weaning Stage! This is her second child so she's already an expert with the weaning process, but that hasn't stopped her looking at new, healthy products to try with baby Layla. I've recently started weaning my baby girl, and having been dreading the mess and drama of blending/mashing food with two kids needing my attention. 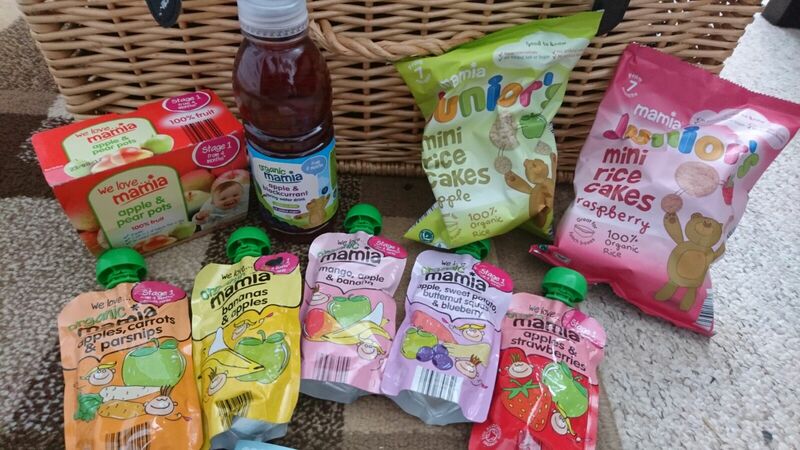 However, I received a free Aldi Mamia hamper full of essentials to take part in their #MamiaDaysOut Challenge and it is has made my life SO much easier! Aldi's award winning Mamia baby food range is 100% organic with no added sugar and is ideal for at home or on the go. It has a variety of fruit and savoury pouches, fruit pots, rice cakes and flavoured spring water starting from as little as 59p!! I'm loving the pouches, as they are so handy and mess free, they don't take up much space in the changing bag unlike jars and Tupperware pots! They make trips out easier and hassle free. I don't need to worry about getting bits out the freezer the night before etc, just choose some flavours from the cupboard, put in the bag and go. Mamia food range also makes it easier for Nanny days, no blitzing and mashing for her! All she needs to do is stand the pouch in hot water for a few minutes then squeeze into a bowl or straight onto a spoon. Nanny definitely appreciates me putting these in the changing bag! The texture of the Stage 1 products are perfectly smooth purées, which you can't always get when mashing up food yourself, making it easier for the beginning of weaning. My baby girls favourite at the moment is bananas and apples, she enjoys squishing the pouches so wont be long until she is feeding herself! I will definitely continue to use Mamia as part of the weaning stages and will introduce the rice cakes and other snacks when my baby girl is ready. The value for money is amazing. The pouch looks like it's a good size & you could possible get two or more meals out of them. When I had my first they said to start weaning at 6 months but they were always ready before then and I couldn't wait to wean. Grea tto see how you got on and lovely pics. Commenting for myself and on behalf of BritMums and thanking you for taking part.